This Aug. 18, 2017, file photo shows the Walter Kerr Theater, home to the Broadway show "Springsteen on Broadway," in New York's Theater District. After checking off all the rock star superlatives in his 68 years, Bruce Springsteen has set out to create a wholly new performance template. "Springsteen on Broadway," which opened Thursday night, is a deeply personal life story with a soundtrack, a one-man (or one-man and one-woman for two songs) show that's by turns funny and touching. He's onstage five nights a week through Feb. 3 in what has been called his Broadway debut. The distinction is important. This is a set piece, not a concert where Springsteen usually changes his set-list from night-to-night. He motioned to fans who greeted him at Wednesday's final rehearsal with cheers and familiar "Bruuuucce!" shouts to sit down, and stopped people from clapping along to "Dancing in the Dark" by saying, "I'll handle it myself." The songs - 15 of them in a 130-minute performance - were secondary to Springsteen's stories about growing up in Freehold, New Jersey, the peeks into what he's reached for artistically and pokes at his own persona. 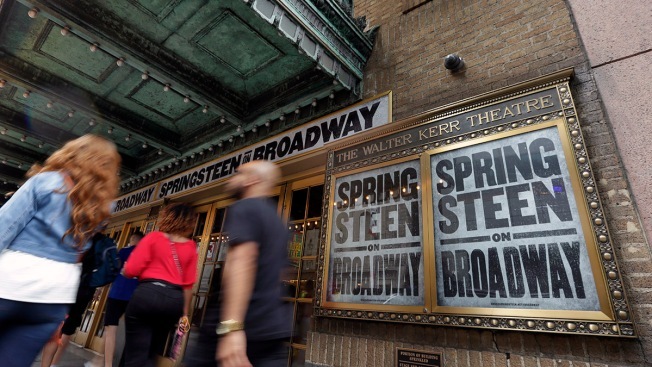 The intimacy of the 960-seat Walter Kerr Theatre is what made it special; Springsteen could step away from the microphone for a verse or two and not worry about his voice not reaching the rafters. "I have never held an honest job in my entire life," Springsteen said. "I have never done an honest day's work. I've never done hard labor. I've never worked nine to five. And yet, that is all that I've ever written about." Reciting a stream of his own lyrics about the "death trap" and need to run from the swamps of Jersey, he deadpanned, "I live 10 minutes from my hometown." "I came from a boardwalk town where everything is tinged with a bit of fraud," he said. "So am I, if you haven't figured that out yet." Some of Springsteen's stories about growin' up (the title of his opening song) should be familiar to readers of his autobiography, and he even reads from it. He has a keen eye and novelist's sense of detail. Talking about going into a bar at his mother's behest to tell his father it was time to go home, he described his dad's entire outfit, down to the belt, and the mix of smells exotic to a young boy's nose. His monologue about the neighborhood that constituted an 8-year-old boy's world segued into Springsteen performing, on piano, the song "My Hometown," which begins with the lyric, "I was eight-years-old and running with a dime in my hand." Stories of his father, Douglas, and mother, Adele, contrasting moods of darkness and light, were accompanied by performances of the songs "My Father's House" and "The Wish." Local police weren't sad to see Springsteen go when, at the age of 19, he packed up his belongings and left Freehold. His family had scattered, he had no job and seemingly no future, yet he spoke wistfully of the experience. "It's the one thing I miss about growing older," he said. "I miss the beauty of that blank page and the endless possibilities." He followed with "Thunder Road," which, like most of his songs, was stripped to its essence, the lyrics coming in clearer focus in the context of the stories. Much of "Born in the USA," his biggest moment in the bombastic 1980s, was delivered in a ghostly whisper. His wife, Patti Scialfa, accompanied him for "Brilliant Disguise" and, when they sang "when I look in your eyes," the audience could see them doing exactly that. Springsteen paid tender tribute to late bandmate Clarence Clemons in the song that references him, "Tenth Avenue Freeze-Out." He told of a show where he and his band, looking for the big break, played for a music industry contact reached through his girlfriend at the time. The bigwig said he though Bruce and the band were terrific. "Then he slept with my girlfriend and left town," Springsteen said. "What's so funny about that?" he retorted. The performance offered a new way to experience someone usually only visible as a speck on a distant stage, a new way to connect with a hero. Since Springsteen's fans are willing to spend hundreds of dollars for the privilege, it's something that other artists closer to the end of their performance careers would do well to take notes on. Upon reaching a certain point - roughly when fame and fortune intruded - Springsteen lowers the curtain on his own life. The audience leaves with a vivid picture of Springsteen as a boy, yet nothing about him as a father. His youthful dreams have come true, and then some. What's that like? While Springsteen brings his story full circle by telling of his distress in returning to his childhood street and finding the tree he had climbed as a boy had been cut down, much of the latter third of "Springsteen on Broadway" is outward looking and feels more like a concert than a show. His advice for dealing with the world's troubles is to "lace up your dancing shoes" and he did so, ending with "Dancing in the Dark" and "Land of Hope and Dreams." And, of course, "Born to Run." Among the stars seen entering the Walter Kerr Theatre for the Thursday night premiere of "Springsteen on Broadway" were filmmaker Steven Spielberg and wife actress Kate Capshaw; actor Tom Hanks; actress Tina Fey and her husband composer-actor Jeff Richmond; actress Laura Linney and husband Marc Schauer; comedian Jon Stewart and wife Tracey; composer Andrew Lloyd Webber and daughter Imogen; CBS CEO Leslie Moonves and wife TV host Julie Chen; and designer Ralph Lauren and wife Ricky Anne Loew-Beer.